America's fourth-largest carrier finally goes Apple, and you've got to wonder what that means for all the Androids on shelf. T-Mobile USA broke the long-anticipated news this morning, a day after announcing new, unlimited rate plans that ditch subsidies. iPhone comes with 4G LTE roll out in select cities and expanded HSPA+ coverage to the 1900MHz band. Subsidy-free plans, network expansion, iPhone availability and MetroPCS merger are all part of a bold "bet the company" strategy. 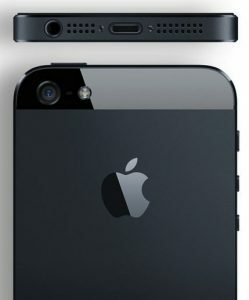 T-Mobile will start selling iPhone 5 on April 12, for the lowest upfront-price among major carriers: $99.99. The rest is paid off in monthly payments and for full price of the handset and no contract. Rivals charge $199.99 up front with 24-month contractual commitment and hefty subsidy should customers change carriers before the term expires. "This is an important day for people who love their iPhone but can’t stand the pain other carriers put them through to own one", John Legere, T-Mobile CEO, says. "We feel their pain. I’ve felt the pain. So we’re rewriting the rules of wireless to provide a radically simple, affordable iPhone 5 experience -- on an extremely powerful network". Ross Rubin, Reticle Research analyst, says the price "seems too good to be true". That's T-Mobile's big carrot, perhaps more than the new data plans. Customers walk out the door spending upfront for iPhone 5 what competitors sell the 4S for. One C-note. To support iPhone and other smartphones, T-Mobile is expanding its 4G network beyond HSPA+. LTE launch cities are: Baltimore, District of Columbia, Houston, Las Vegas, Kansas City, Phoenix and San Jose. (Damnit, not San Diego). The carrier promises nationwide coverage by end of year. HSPA+ supporting iPhone 5 is available in 229 metro areas, according to T-Mobile. iPhone is U.S. market share leader, according to Strategy Analytics. While Android rules the world, iPhone rules the roost. T-Mobile has good reasons for coveting the iconic handset, which could unlock lots of customer upgrades while stemming some customer losses to competing carriers. That certainly was the case for Verizon, but less so Sprint. During fourth quarter, AT&T sold 10.2 million smartphones and activated 8.6 million iPhones. Surely T-Mobile would love even a small percentage of such sales success. 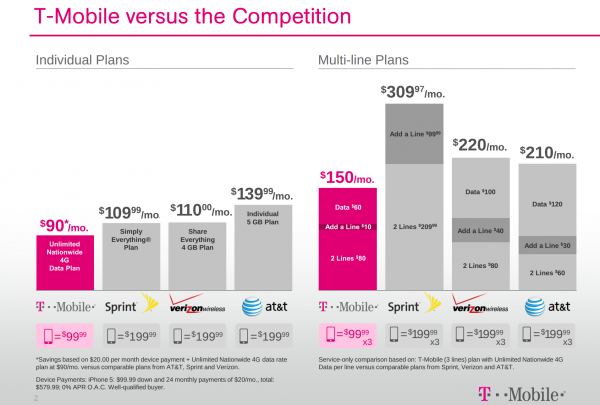 The above chart is T-Mobile's comparison of its no-contract plans to options available from competitors. Does this jive with your real-world experience? Supporting Simple Choice plans offering unlimited text, talk and data and no contractual commitment, T-Mobile assumes label "The Un-carrier", by placing emphasis on choice and freeing customers from forced lock-in. The new rate plans are a huge risk that, if successful, could fundamentally change how Americans buy cell phones -- particularly if any of the Big Three offer something similar. Typically, carriers pay Apple huge amounts up front -- say $649 for 16GB iPhone 5 -- and sell the mobiles subsidized for much less, while locking customers into two-year contracts. Under T-Mobile's new plan, there are no subsidies, but customers pay full price, either upfront or by monthly payments over X number of months, usually 24. There also is option for people to bring their own phones. I haven't done a first-plush comparison but looks like the savings are more for people buying cheaper handsets with little data. For costlier smartphones and data plans, savings are iffy -- or so I say after only cursory comparison, without really number crunching. During a press event, Legere tried to explain the new Simple Choice plans to dimwits like me. He makes a good case for greater transparency and simplicity about billing and customer costs. I have to agree -- then there is the whole subsidy model, which favors Apple and a few other manufacturers reaping big margins by invisibly keeping device prices high. That $199 you pay masks the $649 the carrier dishes out. Legere claims that the wireless industry is broken, and he gets no dispute from me -- and judging from the live Twitter responses today -- nor from many other cell phone users. But complexity and hidden costs cut different ways. T-Mobile's iPhone 5 pricing looks like less than other carriers, but there is still monthly commitment to pay off the phone. That works out to $20 over 24 months, or about $580 when adding the initial money down. Reporter Brian Chen asks my question (via Twitter), too, when looking over the new plans. "Despite T-Mobile's campaign to be a transparent 'un-carrier', I'm confused about the two-year device fees and the restrictions on phones. The phone can't be unlocked until the two-year device fee is paid off. How is this different?" Difference is choice. Still, I'm on AT&T (for now) and the early termination fee decreases month by month during the contract period, so walking away and paying the ETF isn't so different from leaving T-Mobile and paying off the rest owed on the phone. Jason Snell, Macworld editorial director, answers Chen (and indirectly me): "Different because when you’re done paying (after 2 years), your bill actually goes down. And you can BYOP and not pay fee".